I've only just gotten up to the part where Skeeter begins her project by interviewing Aibileen and Minny, but with three different narrators and a beautifully written and detailed narrative--you can literally read the different voices these women have--it's a surprisingly gripping read. Kind of reminds me of The Secret Life of Bees a little bit, but the similarities are really just that it's Southern, the '60s, and about relations between white and black people. Entertainment Weekly had a cover story last week on the film, the book, and the reaction to both, since the author is a white woman who grew up in Mississippi and was raised largely by an African-American maid. I knew the book was selling a lot, that it was very popular, but I don't often read a lot of more recent fiction and in particular, I don't necessarily read a lot of popular fiction. It's not a literary snobbery thing, only that there is only so much time to read--time that I could be spending writing, of course. But reading is important, too. It lets me get of my head and jump into someone else's for a while and see how much more I can improve, how much more in depth I can become. 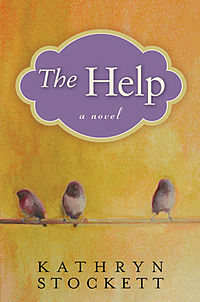 Any of you read The Help yet? Edited to add: I finished it. Loved it. Cried at a few parts.